Netflix’sCFO said last week the company plans to spend $US8 billion on 700 new shows this year. UBS analyst Eric Sheridan says this will only widen the company’s competitive moat. Netflix is planning to spend some $US8 billion on roughly 700 new original TV shows in 2018 as part of a move that will only widen its competitive advantage, according to UBS. 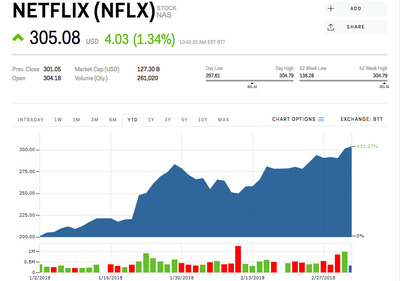 UBS raised its price target for Netflix to $US345, the most bullish of analysts polled by Bloomberg. That’s 15% above where the stock opened Monday. By comparison, Wall Street has a consensus target of $US267, about 12.5% below where it currently trades. “Out of the existing 700 million global broadband households (excluding China), Netflix has only penetrated ~17% in aggregate – while US penetration has reached ~60%, international penetration remains only ~10%,” Sheridan wrote. Netflix is up 51% so far in 2018 – well outperforming the rest of its FAANG companions.